Local dignitaries and members of the CLPG almost at Withy Jct. One more stop and they will be able to sample the delights of Sam's Cider. A B-set waits the arrival of the "Cornwall Express". A rake of LMS suburban stock headed by an Ivatt 2-6-0 on a local stopping service. Next stop Durscombe. The arrival of the daily goods from Cornwall. Due to heavy traffic an extra from Cornwall passing Squire's Halt en route to Durscombe. An overall view of a rather naked Withy Jct. Many thanks for those photos., Brian. 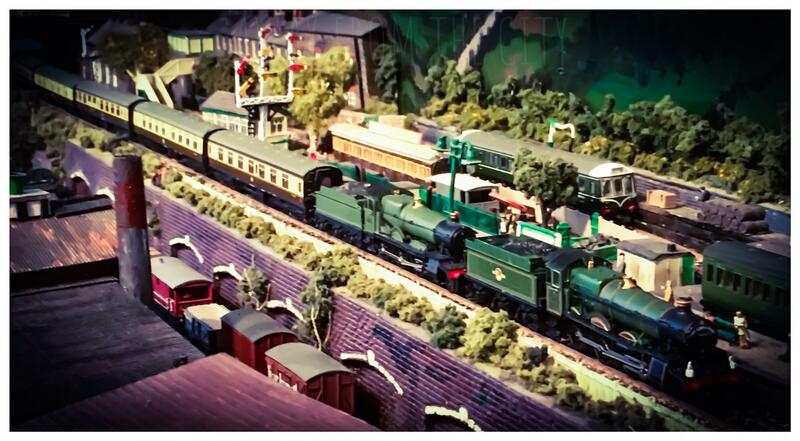 Delighted to see that the two passenger and two goods trains all arrived safely in Somerset from Cornwall. I'm sure the passengers on the special through passenger train to Withy Junction conveying members of the CLPG and GWS in Cornwall, together with local dignitaries, will be enjoying a special buffet and cider sampling at the cider works of "Sam's Cider". 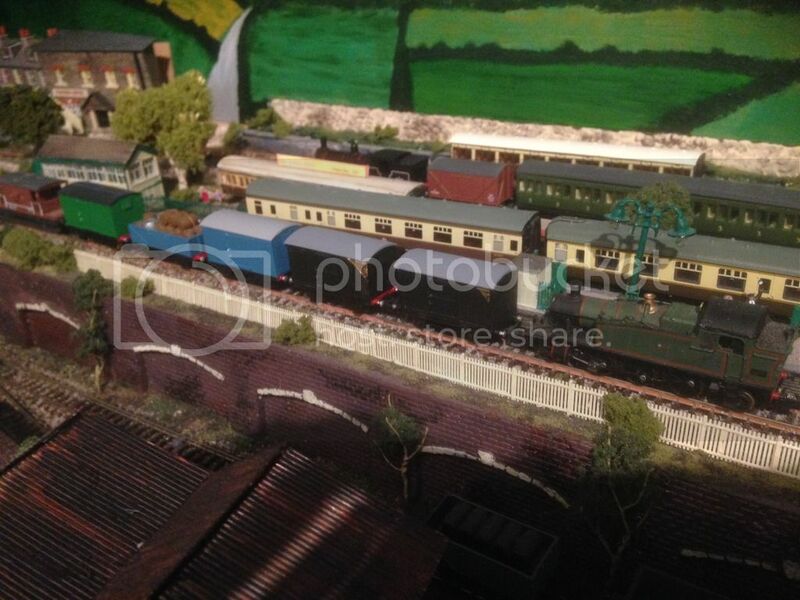 Great to see the various new wagons and coaches on your layout. The suburban coaches look right at home behind your Ivatt 2-6-0. In view of the great reception that the two passenger and two goods trains have received at Withy Junction and Durscombe, the Wadebridge yardmaster has been consulting with members of the Cornish Locomotive Preservation Group (CLPG) and the Great Western Society (Cornish branches). The local GWS have, in turn, been talking to their good friends in the West Midlands who have been talking to their LMR friends . . . The result is that some more special goods trains of BR, GWR and LMS stock are scheduled for departure from Cant Cove, next month, for Somerset, after inspection. However, their are rumours that a special GWR goods train is already being prepared in the West Midlands . . . The "Castle Estates", Cant Cove, are scheduling more timber trains including to / from Somerset and the CLPG have been contracted to prepare rakes of single- and double-bolster wagons in both new "Castle Estates" blue and BR Late Bauxite which are scheduled for completion, next month, along with two more Single Vent vans and a 7-plank wagon in "Sam's Cider" green. However, as the CLPG also have a rake of horse boxes of two different designs to complete in BR Crimson & Satin Black livery, next month, the painters are rather busy, at present! The advent of very cold weather, next week, has delayed completion of the painting but warmer weather is expected thereafter. Thanks for the pictures Brian. Looking very promising for through running from Cornwall to Somerset and beyond. A two-coach special train from Penmayne to Withy Junction, chartered by members of the CLPG and GWS invited to help setup the proposed Mid-Somerset Railway Preservation Society, and running in a goods train path, is seen departing Cant Cove en route to Wadebridge where the "Castle Brewery" and "Headland Brewery" vans will be removed for forwarding to Trepol Bay and Port Perran with the week's beer deliveries from the "Castle Brewery", whilst the "Headland Brewery" van has the empties from the previous week. At Wadebridge more members will join the train having come up by a special connecting train from Trepol Bay and Port Perran. The WR ex-ER Gresley design Buffet Car will be removed at Exeter leaving just the two WR carriages and the "Sam's Cider" van, again, with the preceding week's empties, to work through to Withy Junction behind local steam power. The landlord of the "Durscombe Arms", Sidney Ambrose, having already arranged a follow-up meeting, a special train from Cornwall is, as you can see, above, on its way to provide advice from CLPG and GWS members on how to form a Mid-Somerset Railway group and, later, a Mid-Somerset Railway Preservation Society. The members will be thirsty and hungry when they arrive as their Buffet Car will be removed at Exeter as the WR needs it. Unfortunately, the 'Chelsea Girls' are on tour promoting the Cornish Christmas events so there was no-one to stock the guard's compartment of the train with further supplies after the removal of the Buffet Car before leaving Devon (that coach had been stocked up by the staff of "The Railway Hotel", Cant Cove, though). Unfortunately, weekend engineering work in the area of Trepol Bay had prevented the arrival of the usual share of on board supplies from the "Railway Hotel", Trepol Bay. Sidney Ambrose is having his work cut out now organizing the forthcoming special train. He has decided that as he has a marquee that's used for special events at the Durscombe Arms, he will bring it down to Withy Jct to set up at the station as at the moment there are few facilities there. He is trying to arrange a"guardsvan ride" up and down the long siding and has made enquiries as to the possibility of running an auto-coach to and from Withy Jct to Durscombe. Local dignitary has been invited. The success that North Cornwall is having is stimulating great interest. Sidney, a man of many connections, thinks he can persuade a group of models called the "Bristol Beauties" to come and help. Confirmation is expected shortly. The directors at the Headland Brewery at Trepol Bay are keen to support the formation of a Mid Somereset Railway Group. Unfortunately as mentioned engineering work between Trepol Bay and Wadebridge has meant that supplies of ale from Headland Brewery could not be loaded onto the special train from Cornwall. Very keen to lend support the Directors have (at VERY short notice) arranged for a special supply of Headland Ales to be made available to Sidney Ambrose in his marquee at Withy Junction. After negotiations with BR(W) a special train will run to Withy Jct via Chacewater and Truro and then up to Exeter and on to Somereset. Due to the VERY short notice there were insufficient Headland Brewery wagons available and so a van and a wagon in Castle Brewery livery were requisitioned along with a Sam's Cider van to supplement the 2 Headland vans available. It sounds like a very busy time is ahead at Withy Junction. Fortunately the 'Chelsea Girls' are on tour with their Mercedes Christmas van, at present, so the 'Bristol Beauties' will not face any competition! The "Castle Brewery' is very busy producing extra beer for the coming Christmas and New Year period to ensure that all the local licensed premises are fully stocked but managed to send a couple of barrels of "Castle Ale" in the guard's compartment of the special train, namely, one of Castle Brewery Old Strong Winter Ale (ABV - 5.5%) and one of Christmas Ale (ABV 7%). However, both these prize-winning ales will need some days to settle and the Christmas Ale will not be in peak form until the beginning of December. The guard's compartment did also contain the last few crates of Castle Pale, Brown and Imperial bottled ales that the visitors had been keeping back for the return trip but, selflessly, voted to give their hosts to sample, along with a large wicker basket of the North Cornwall Pasty Co's fine pasties and special mince pies (the fruit is pre-soaked in port and brandy). However, the visitors have heard that, in addition to the cider works there is also a local brewery in the area with Somerset ales worth sampling? 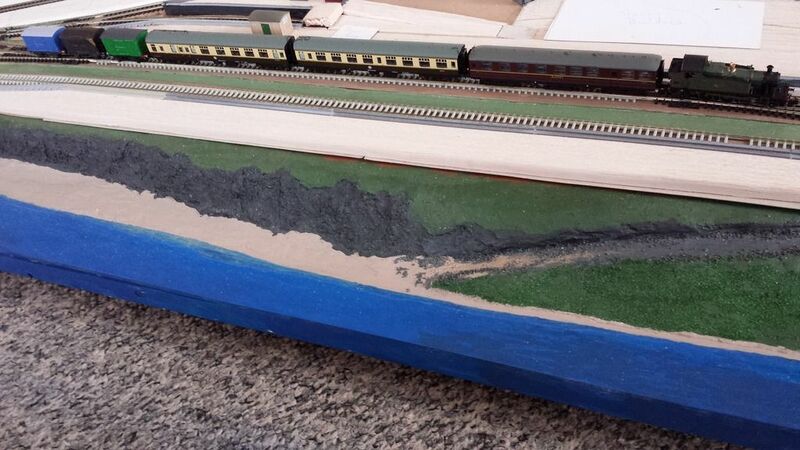 A BR SR CCT is being prepared at Trepol Bay and then Cant Cove to be filled with local food and drink to be sent off to Exeter on a through train where the loaded CCT will wait for attachment to the special train on its homeward journey. Whilst the loco. is changed at Exeter the passengers will transfer as much food and drink into the guard's compartment as possible to make up for the Cornish food and drink they have left for their Somerset hosts and friends. Already there is talk of sending a similar CCT to Withy Junction before Christmas with best Cornish produce. Yes, I forgot in the rush to get things organized, the Durscombe Arms sells Creech Real Ales, well noted in Somerset. Amongst the favorites is Creech Special, a beer with a kick and Pheasant Red. As the name suggests, a deep ruby beer. I think this meeting will be well provided for both in liquid refreshment and food. I understand that some typical Somerset cuisine will be provided too. I think some barrels of Creech Ales will be returning in the guard's compartment! There were red faces at Wadebridge as it was belatedly discovered that a "Castle Estates" van and open wagon had been sent urgently to Trepol Bay instead of the darker blue "Castle Brewery" ones that had been requested for the special train to Withy Junction. However, the mistake is understandable as there are no spare "Castle Brewery" vans, Conflat Containers, or wagons as they are being loaded at the brewery with the pre-Christmas orders. 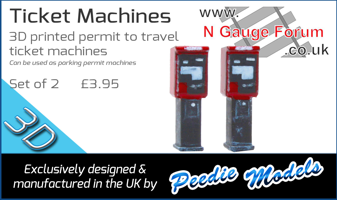 The mother of the youngest shunter at Wadebridge has given the Yardmaster a piece of her mind for telling off her son for sending "Castle Estates" vehicles instead of "Castle Brewery" ones to Trepol Bay, that week. "If the signwriter at Cant Cove spent less time in the "Tramway Inn" perhaps them wagons and vans would've 'ad names on thur sides by now!" Page created in 0.451 seconds with 38 queries.